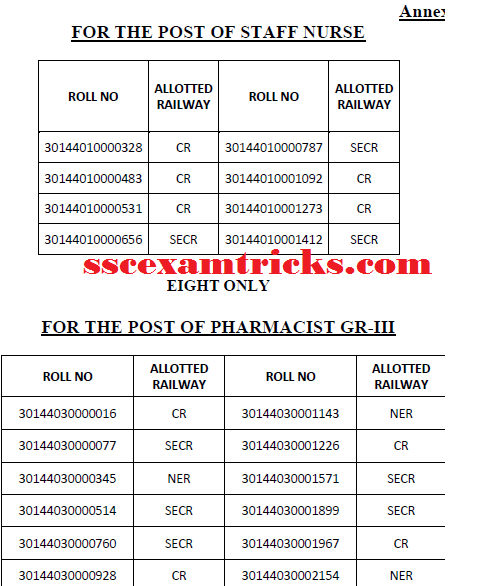 RRB Paramedical Staff Final Result 2015 All Regions Merit List Cut Off rrb.gov.in - Download RRB Paramedical Staff Document Verification Schedule. RRB Paramedical Staff Result Latest News: RRB has declared final result for RRB Bilaspur Region and final result for rest of RRB Region will be announced soon on official website www.rrb.gov.in for Paramedical Staff in August 2015 (expected). The latest news is that RRB Bilaspur has declared final result for paramedical staff on the official website. The result can be downloaded here. RRB Bilaspur Final Result has prepared from written test held on 08/02/2015 and document verification on 03/06/2015. In the final result, Cut off marks for normal vacancy has been displayed against the number of vacancies for Paramedical staff of RRB Bilaspur Region. 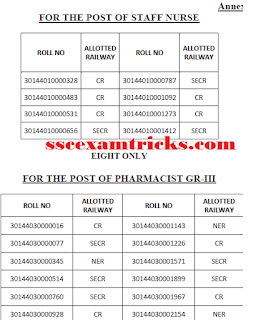 Railway Recruitment Board (RRB) had successfully conducted written test for 951 posts of Staff Nurse, Pharmacist Gr. III, ECG Technician, Radiographer, Lab. Technician/ Assistant, Dietician, Male Field Worker, for Cat.No.01, 03, 04, 05, 06, 13 & 15 respectively against Centralized Employment Notice No. 04/2014. The written test was held on dated 8th February 2015. The RRB Paramedical Staff written test was held at Ahmedabad, Bilaspur, Secundrabad, Ranchi, Jaipur, Kolkata, Hubli, Delhi, Mumbai, Chennai, Jabalpur, Ajmer, Patna, Bhubaneswar, Gorakhpur, Allahabad, Guwahati, Hajipur centres in which about 8.5 Lakhs candidates had attended RRB Paramedical Test and waiting for result/ cut off / merit list. RRB has announced Result of written test of Paramedical Staff for Bhopal Region on 15 July 2015, Bilaspur Region in May 2015, Jammu Region on 26 June 2015, Muzzaffarpur Region on 12 March 2015, Secunderabad Region on 17 June 2015. The Paramedical Medical written test result for rest of RRB region will be announced very soon. The selected candidates were called for document verification. The list of documents required at the time of verification by RRB has been announced with document verification schedule on official website. SscExamTricks.com will inform you about latest news of result, document verification schedule and final result of RRB immediately after announcement/ published/ released. RRB Paramedical Staff Final Result is expected to be announced in month of August 2015 for these regions. RRB will declared a merit list / selection list of candidates for the rest of RRB regions on official website in which roll number of candidates will be given with document verification schedule (date, time and venue). You can get latest news of Final result appointment & station allotment on the official links of All RRB Regions given below.